By 6:30 PM, the crowd at the Bickford Centre was spilling out into the courtyard. Inside, the presentations weren't due to start for another hour, and the place was already packed. The hallway past the auditorium was lined with displays showing the evolved—and evolving—vision for Toronto's Mirvish Village. 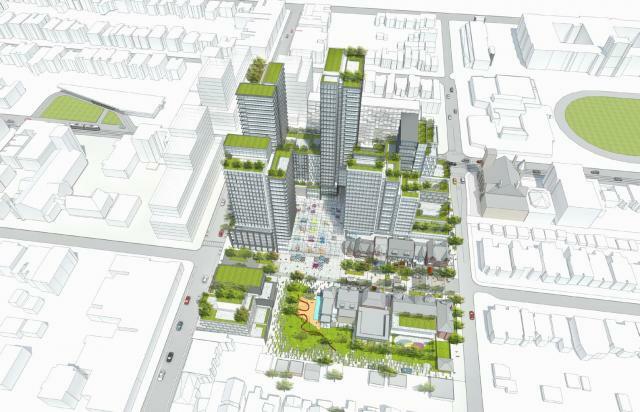 Still home to Honest Ed's, the 1.8-hectare site has become the subject of one of the city's most publicized and transformative development proposals following Westbank Corp's purchase of the property in 2013. The June 13th meeting took place well into Westbank's rigorous planning process, outlining the scope of the revised proposal submitted to the City of Toronto in May. 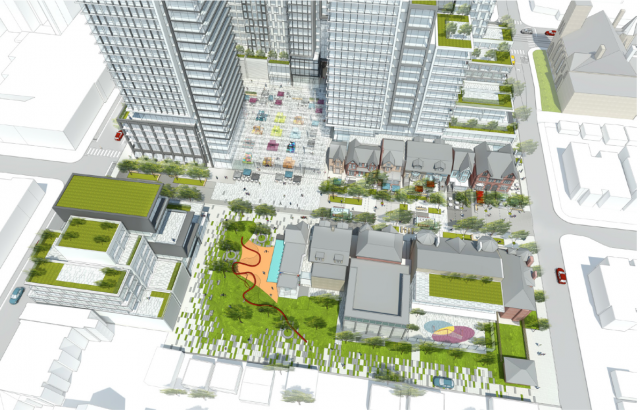 Following extensive rounds of public consultations, the 2015 proposal has been noticeably altered, evidencing a greater emphasis on heritage preservation, public space, and contextually sensitive massing. 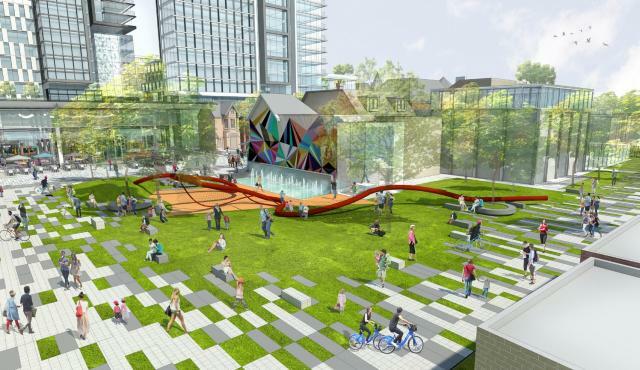 While the overall density—and streetwall height—of the project has been slightly reduced, a new park space is now proposed, and 6 additional heritage-listed buildings are now slated to be retained. 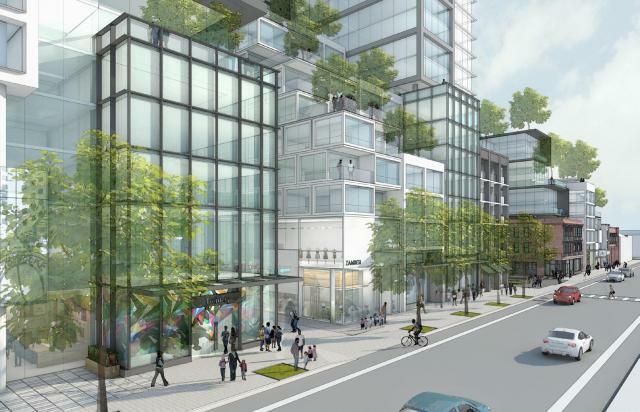 While the initial proposal called for 1,017 residential units, the revised framework includes 928 suites, all of which are still planned as rental apartments. A substantially revised unit mix is also in the works, with 163 studio (17.5%), 390 one-bedroom (42%), 259 two-bedroom (27.9%), 90 three-bedroom (9.6%), and 26 live-work suites (2.8%). This compares to the 62 studio (6.1%), 462 one-bedroom (45.4%), 390 two-bedroom (38.3%), 87 three-bedroom (8.6%), and 16 live-work units (1.6%) originally planned. In terms of heritage preservation, 21 properties are now set to be retained, with an emphasis on maintaining the historic character of Markham Street. When Westbank purchased the land three years, none of the site's properties were heritage listed or designated, with the City subsequently moving to list 27 on-site properties. In the 2015 submission, 15 of the newly-listed buildings were set to be preserved, with additional buildings added following community input. Drawing on community input, Westbank's refined approach to heritage retention prioritizes full three-dimensional retention of built form, while ensuring in-situ preservation wherever possible. Facilitating the more extensive heritage preservation along Markham Street, a previously proposed mid-block building is deleted. Besides allowing for retention of existing built form, the reduction in density opens the street to a new public space, with a public park fronting Markham Street now proposed. New renderings detail a gathering spot that slides into adjoining spaces, weaving the public realm into the development. Alongside the park, the new plan also features a dog run and community garden plots. 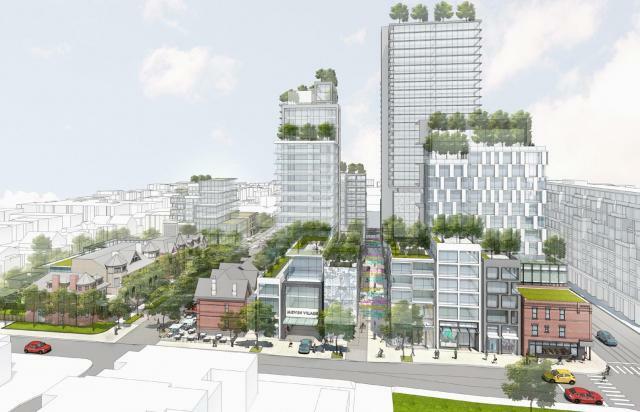 According to the updated planning rationale, the changes to Markham Street—which required the Markham tower to be shifted east—also enable a new alignment for Honest Ed's Alley, which can now remain in its current location. Otherwise, the project's fundamental principles remain in place. Westbank's team—consisting of Henriquez Partners Architects, ERA Architects, Janet Rosenberg + Studio, Reshape Strategies, and Urban Strategies—has maintained the fine-grained urbanism that characterizes the plan. 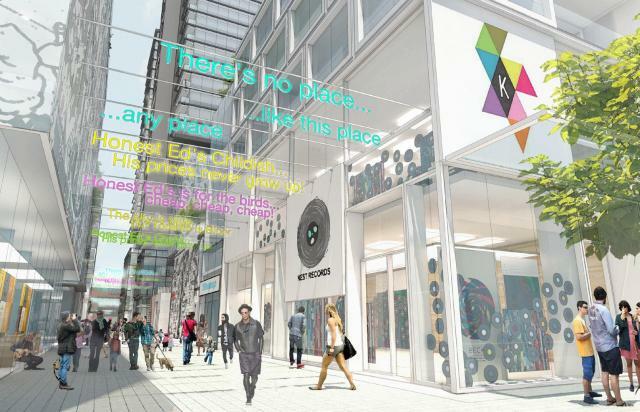 A seemingly organic mixture of architectural typologies and volumes still defines the proposal, with abundant small retail spaces (including a collection of micro units) and public art installations meant to preserve and enhance the area's eclectic commercial character. At the heart of the flexibly programmed development, the public market remains central. Likewise, the units above remain rental suites, while a continued commitment to start-up incubation is underscored via a partnership with the Centre for Social Innovation. As outlined in the presentation, the genesis of the project's evolution is directly traced to input provided by the community. Throughout the planning process, Westbank have stressed the importance of engaging the community, going far beyond the perfunctory—at times almost reluctant—consultations sometimes undertaken by developers. Where community interests are sometimes seen as impediments to new development, the Westbank team has stressed the importance of building a project that reflects and serves the community. Besides uncommonly comprehensive series of public consultations, the developers have also engaged area residents through Markham House, a city building lab operated by Westbank on site. Offering project information and opportunities for feedback, Markham House also curates a series of locally-sourced installations, incubating opportunities for dialogue between the developers and the community. Recently, Markham House has hosted writer Jay Pitter's "The Honest Ed's Project," bringing the intimate narratives and histories of area residents into the development process. Rather than rushing to advance a predetermined proposal through the planning process, much of what's seen here draws from local context. Following the presentations, community members were given the chance to comment on the new proposal, closing out the night with a lively series of questions. Ahead of the question period, however, comments from City Planning—and local Councillors Mike Layton (Ward 19) and Joe Cressy (Ward 20)—set the tone for the discussion to come. According to a Planning representative, the resubmitted proposal presents "an evolution that moves a number of our priorities forward in a positive way." The inclusion of park space was particularly praised, along with the greater commitment to heritage preservation, though a preference to retain all 27 listed properties on site was also voiced. Additionally, "general uneasiness about height and density," along with concerns about the unit mix, was noted. Before the presentations. Councillors Layton and Cressy also shaped the scope of the discussions to come. Layton stressed the need for residents of both wards—which share a border on Bathurst Street—to come together as a "united community" in considering the project. Cressy was somewhat more direct in his remarks, arguing that the project needs to "keep the good" (i.e. rental housing and entrepreneurship incubation) as the proposal continues to be refined. 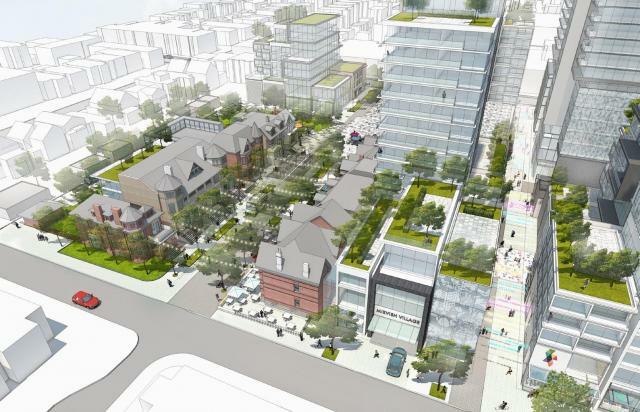 However, Cressy also offered a pointed critique of the development's height and massing. Does the project need to become shorter? The Ward 20 Councillor left no room for uncertainty. "I'll tell you before you've even seen it. Yes." Many in the crowd agreed, and the young Councillor was applauded back to his seat. Indeed, many of the questions and comments focused on the height of the towers. 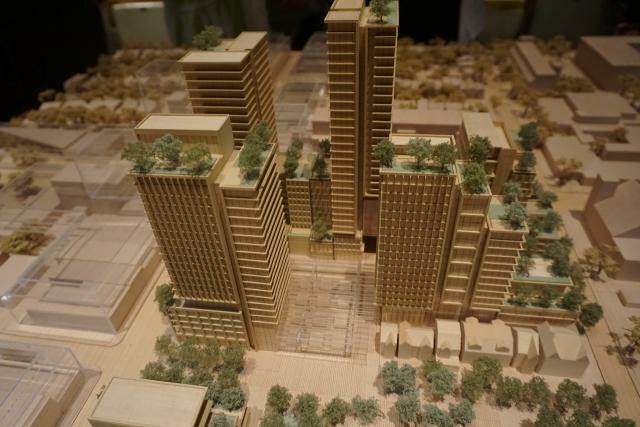 Although the development's towers have been slightly reduced in height and reconfigured away from Bloor Street, many in the audience remained worried about the scale of the project. "Look at it," one commenter said, gesturing to the scale model in front of the stage, "it sticks out like a sore thumb." Although a number of community members were happy with the progress made since the last submission, the numerous concerns about the towers being "too tall" were met with enthusiastic applause. "It's just completely out of place." Alongside comments about height and massing, the new unit mix was also critiqued. In particular, the increased number of studio units was seen as a move towards "concrete shoeboxes" by one commenter. Responding to the concern, the development team cited the inclusion of more three-bedroom units (90/928, as opposed to 87/1,017) as a priority of the new design. From there, the new—and arguably worse—unit mix was presumably worked out to protect the project's economic viability in the face of reduced scale. (In total, the new proposal represents a 3,000 m² decrease in GFA). Although many of the questions and comments offered critiqued the scale of the project, many audience members—even those who remained critical of the project—were pleased with the recent changes. A notable proportion of comments were also almost entirely positive. A representative of the Hot Docs Festival praised the public park as a possible screening space, admonishing the development team to consider a partnership with the local institution. Meanwhile, a young commenter who identified as "an 18-year old student" took to the microphone to defend the density proposed on site. "This is a wonderful community," he told the audience, arguing that the large-scale density proposed is "the only way to allow young people to live in this neighbourhood in the future." He was enthusiastically applauded too, stopping to shake outstretched hands on the way back to his seat. The young man was directly followed by an equally impassioned community member several decades his senior. His comments were not so positive. "It's totally inappropriate," he told the audience, citing the Bathurst-Bloor Four Corners Study as a guideline for the area. 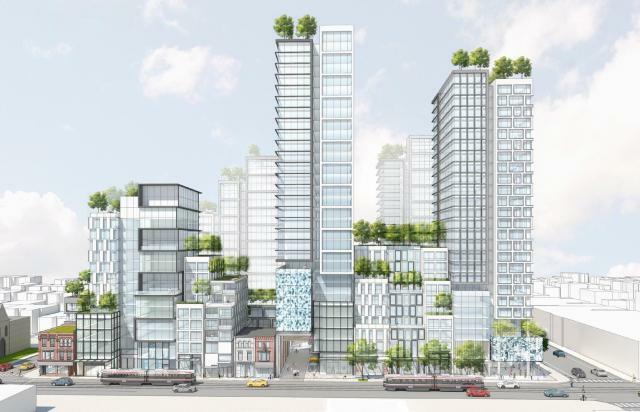 Since the Four Corners study allows heights between six and nine stories in three of the four corners (although with greater intensity allowed at the Honest Ed's site), the commenter argued that the heights proposed were "ridiculous." His applause was much louder. In the end, a hesitancy to embrace the development still prevailed. Although Westbank's efforts in evolving the project were praised as steps in the right direction, a fundamental resistance to the scope of the project remained. Despite the developer's commitment to respecting the community, and drawing from it for guidance, a public refusal to embrace the type of high-rise density necessary to ensure the project's financial viability seems almost inescapable. At the risk of being reductive, the difference between the two commenters—the young man supporting the project, and the older man against it—illustrates a difference between two mindsets. For many in the community, the priority is to protect the scale and form of the neighbourhood that exists. In this regard, the increased heritage retention at ground level was widely praised, and the towers above were condemned. For others, however, the priority is not only to protect and preserve what's there, but also to build an inclusive community for the future, and one that can accommodate Toronto's rapidly growing population. In that regard, embracing new density is necessary. Writing about Toronto's other transformative Mirvish project—King Street's Mirvish+Gehry towers—the Toronto Star's recently retired architecture critic, Christopher Hume, contemplated the complexity of heritage. "There are two types of heritage, let’s not forget: one we inherit; the other we bequeath," he wrote. With more of Mirvish Village's buildings now set to be preserved, a consensus is emerging about the type of heritage we want to inherit. The trouble is that we still can't decide what kind of heritage—and what kind of city—we want to bequeath. We will keep you updated on the project as it continues to evolve, and new details come to light. For more information, check out the associated dataBase file linked below. 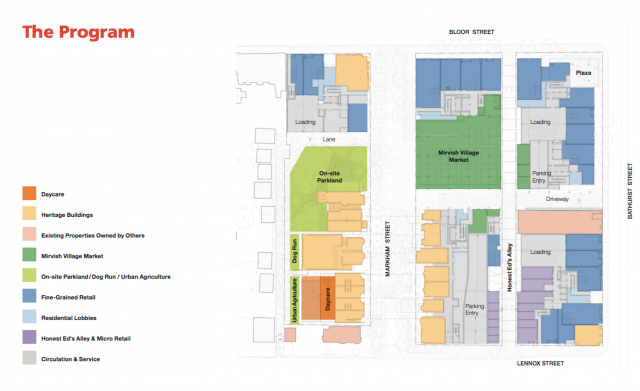 The Mirvish Village project also has a dedicated planning portal on the City of Toronto's official website, linked here. You can join the conversation by contributing to our dedicated Forum thread, or by leaving a comment in the space below this page.